Deep down inside, all of us we know where we sit on the scale of coffee making abilities. In my opinion the scale goes a little something like this. You have the excellent ability to order a daily takeaway from your local barista. Doesn’t take long to feel the pain of the $3.50–$4 which we all know is like the drink equivalent of the controversial smashed avocado and before you know it you own a Nespresso pod machine (60 cents/cup yay!). Once you figure out you are only consuming 5gm of coffee it’s a short and slightly expensive leap to a real coffee machine with a group handle. And all of a sudden you are burning beans and cursing the day you bought it. That is until you start to figure it out one painfully tiny step at a time. Soon you upgrade your Sunbeam machine to an unpronounceable Italian machine and this is when you have truly made it. Until you discover that you now need the Italian coffee grinder and so on. There is only one more step that anyone of us can take at this ridiculously advanced point and that is to actually roast your own beans. Currently this level is beyond the limit of social acceptability and would indicate that counselling might be more appropriate. Where is my household in the above scale? We are hovering at the sub-roasting level. Anyway, bearing that in mind I was recently perusing the whole online world of barista tools looking for that perfect gift for a spouse who has every niche coffee-making accessory already. Queue the knock box, the skateboard made tamper (from Justin La Rose in California), the CO2 removing canister that will keep your beans safe from the nasty stuff we call air. But there was something else available to purchase that caught my attention...a wooden tamper station. What is a tamper station? It holds the group handle securely while tamping the grinds. We have no tamper station. A tamper station is clearly a necessary addition to the arsenal in preventing any possible coffee apocalypse. How much for such tamper station? $200 AUD plus shipping. So in the name of adding to the canon of knowledge on how to get something coffee related at a 100% discount to retail, I present to you my scrap tamper station. I made my tamper station from a laminated block of scrap Tasmanian blackwood and Queensland maple. I used a bandsaw and two holesaw bits to make it in a little over an hour. The process is similar to making a bandsaw box but without the drawer. Your holesaw bits need to be the same size as your tamper and group handle diameters. 1. Start with a squared up laminated block and then bandsaw off a thin layer from the top of the block. 2. Cut a hole in the side using a spade bit to take the handle. Note: If you don’t own a forstner or regular drill bit the same girth as the handle of your group handle you will need to use your spade bit now while there is still wood for the tip to rest on. 3. To use the spade bit, replace the top layer to reform the block and place into a vice (the top and the bottom are just sitting together with nothing but the pressure from the vice). I used a 16 mm spade bit. 4. Mark out for two holes in the thin top layer. 5. Cut the holes. These holes need to be the same size as you tamper diameter (tamper hole) and your group handle (group handle hole). I used a 60mm and a 73mm hole saw bit. 6. Cut one hole in your bottom layer. 7. This group handle hole needs to be drilled through the bottom layer. Note this hole could be drilled in one go (through both layers) if you have a hole saw deep enough. 8. Glue the two layers back together. 9. Remove the remainder of the handle side opening with a chisel. 10. Round all the corners and apply finish. While it might not be the finest of woodworking, the tamper station was easy to make, looks great and would make an awesome gift for your coffee tragic friends. But even more importantly though, it delayed the search for a bean roasting machine for at least a few more months. Kerryn Carter teaches woodwork classes for women and kids in Sydney. 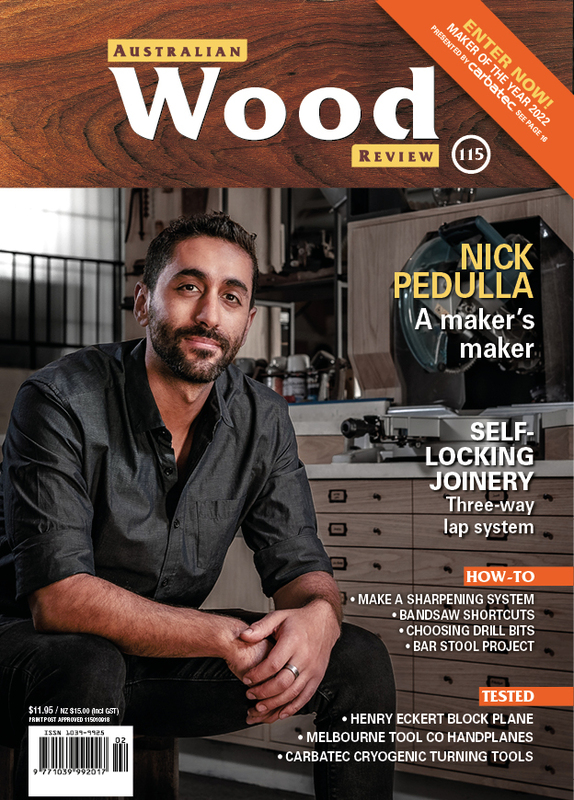 In issue 96 she wrote about making a bandsaw box. In the September issue of Wood Review magazine Kerryn writes about making a series of chopping boards that also form a display unit.